Dr. Theodore Schwartz is internationally known for his pioneering research in the field of epilepsy mapping and treatment. In his laboratory at the Weill Cornell Brain and Spine Center, Dr. Schwartz is leading a research effort investigating brain function - and dysfunction - as related to epileptic seizures. Optical Mapping: Researchers know there is a connection between increased cerebral blood flow and the onset of a seizure, but the specifics of that connection remain a mystery. 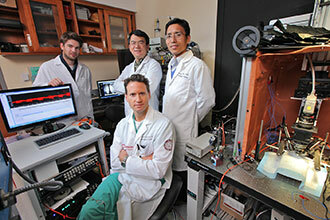 In Dr. Schwartz’s lab, researchers are using optical imaging of blood flow to map the course of a seizure from its onset to its spread throughout the brain. Focal Mapping: The surgical solution to refractory epilepsy depends on precise identification of a seizure’s origin (its focus), so that the malfunctioning area of the brain can be targeted precisely - at the neuronal level. Researchers in Dr. Schwartz’s lab, in collaboration with Dr. Chris Shaffer on our Ithaca campus, are using multiphoton microscopy to study and image individual neurons and map seizures in progress. Femtosecond Laser Microsurgery: Surgical strategies for epilepsy involve preventing the initiation of a seizure or stopping its propagation, by eliminating the microscopic part of the brain that is malfunctioning. The future of epilepsy surgery depends not only on identifying the precise location of that malfunction, but also in “evaporating” that tiny area without damaging nearby healthy brain tissue. Dr. Schwartz’s lab researchers are investigating the use of an ultrafast laser pulse to prevent seizures from starting or to stop them before they spread. These kinds of basic brain research are critical to finding solutions for patients with uncontrolled seizures, but the work is not sufficiently funded by major organizations. The laboratory depends on contributions from generous supporters, whose donations allow Dr. Schwartz to continue this critical research into the brain. Click Donate Now to make a secure online donation using a credit card, or for instructions on how to give by check.